May Madhura Kavi Āḻvār be forever resident in my heart! Madhura Kavi is that celebrated Āḻvār, who had no interest in worldly attainments or Lord’s grace, since his mind was totally occupied by the thoughts about his Ācārya, Swāmi Nammāḷvār. His connection with Ācārya was the only one that mattered to him. His sole enjoyment was the singing of the four great poems of Swāmi Nammāḷvār everywhere as the four Tamil Vedas instead of studying the Upanishads or the divya prabandhams of other Āḻvārs. Madhura Kavi considered Swāmi Nammāḷvār as his Lord (Śeṣi) and with that Śeṣatva jñāna, he was forever engaged in the contemplation of the auspicious qualities of "his Lord". May that illustrious Madhura Kavi, who celebrated his Ācārya's revelations through his "Kaṇṇiṇun Siṛuthāmbu" poem, be the revered inhabitant of my heart’s lotus! Madhura Kavi Āḻvār is our Lord. He is our refuge. will not focus on anything except Swāmi Nammāḷvār. Sanskrit Veda-Vedāntas in Tamil language, is the sustenance for his community. That Madhura Kavi is our Swāmi and the cause for our sustenance. Oh Madhura Kavi, born in the month of Cittirai in Cittirai nakṣatra at Tirukkōḷūr with clear jñāna and who performed inner service for Swāmi Nammāḷvār with intense devotion and without let! You declared that you do not know of any gods other than Swāmi Nammāḷvār. Please bless me now with the jñāna about the eleven verses of Your blessed work Kaṇṇiṇun Siṛuthāmbu that you blessed the world earlier. Even if Kṛṣṇa himself would be living at Dvārakā during Madhurakavi's lifetime, he did not seek Bhagavān’s feet for Prapatti based on his conviction that he has to approach the Lord through a Sadācārya and hence he waited for Swāmi Nammāḷvār's Avatāra to perform Prapatti at His sacred feet. He considered thereafter that his Ācārya's sacred feet alone are the cause of his spiritual bliss and enjoyment and performed uninterrupted service to his Ācārya. Through this act, Madhura Kavi showed the world the ancient, auspicious and safe route of Ācārya bhakti even preferring it to Bhāgavat bhakti. Madhura Kavi thus pointed out that even with the greatest bhakti to Bhagavān; those who do not approach Him through a Sadācārya will not be redeemed. Madhura Kavi instructed us on this very important doctrine for the first time through his Revelation. According to legend, Madhura Kavi was born before Swāmi Nammāḷvār, when Lord had incarnated as Krishna Bhagavān and He was ruling from Dvārakā. This was at the end of Dvāpara Yuga. Swāmi Nammāḷvār was born on the 43rd day of Kali Yuga that follows Dvāpara Yuga. While the Lord was in this world, Madhura Kavi did not elect to seek Him out, but waited and sought refuge later at Swāmi Nammāḷvār. Madhura Kavi Āḻvār was born in the Divya Dēśam of Tirukkōḷūr to a high Brahmin couple. Lord Krishna was still in Dvārakā at that time. 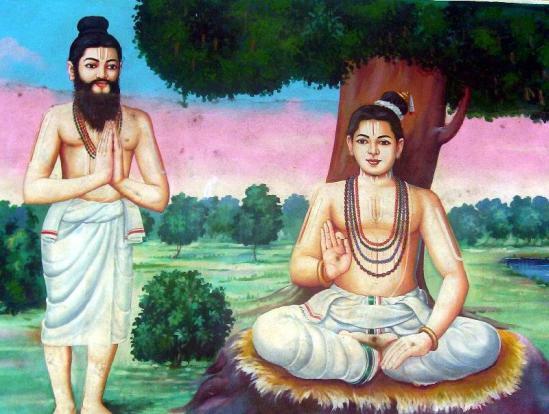 Madhura Kavi mastered his chapters of Sāma Veda and went thereafter on a Divya Deśa Yātrā to northern part of India. He was at Ayodhyā during this trip and one night he saw a bright light in the southern sky. He travelled south by night to find out more about this extraordinary Jyoti. Madhura Kavi traced this divine Jyoti as arising from a sixteen year old Nammāḷvār lost in deep yogic trance inside the hollow of a tamarind tree inside the temple of Tirukkurukūr Ādi-Keśava Perumāḷ. Madhura Kavi was intrigued at the stillness of Nammāḷvār, who had no interaction whatsoever with the outside world. Nammāḷvār was taking neither food nor water. "If the soul born of matter, what will it eat and where will it rest? "It eats That and there it rests." Madhura Kavi immediately realized that Nammāḷvār was "eating" - the Divine -spoken of by Upanishads as the food of mystics - and was living in that Divinity, even if he had taken birth in the mortal body as a liberated soul. Nammāḷvār was describing that emancipated souls are rooted in God and that God is its food, water, breath, mind and bliss. This profound statement made Madhura Kavi realize the greatness of Swāmi Nammāḷvār and begged Him for acceptance as a disciple. Swāmi Nammāḷvār initiated Madhura Kavi in Bhakti and Prapatti Paths and taught Madhura Kavi all His Divine revelations. The elated and fulfilled Madhura Kavi took refuge at the sacred feet of Swāmi Nammāḷvār alone and treated him as his sarvam (Father, Mother, Master and God). Madhura Kavi spent the rest of his life serving Swāmi Nammāḷvār and singing his Divya Prabandhams and spreading the message of Swāmi Nammāḷvār to the world. Madhura Kavi has immortalized his Ācārya bhakti in a prabandham known as “Kaṇṇiṇun Siṛuthāmbu ", which is known for its celebration of Ācārya Bhakti. There are only eleven verses in this divya prabandham. Madhura Kavi Āḻvār sought no identity other than being the disciple of Swāmi Nammāḷvār; he is revered hence by us as one of the 12 Āḻvārs. The other eleven Āḻvārs had mystic visions of the Lord and celebrated the inner auspicious qualities of the Divine Avatars and performed their prapatti to them. Madhura Kavi on the other hand placed Ācārya service/Ācārya-abhimatāḥ (devotion to and surrender at Ācārya’s feet) above everything else including Bhāgavat dhyāna and service. Those who abandon their Ācārya-s, who performed instruction for them about Veda-Vedāntas, will not be blessed with jñāna/scholarly skills in future births. Whatever he/she heard here will also become fruitless and incorrect. The Lord does not accept one without connection through Ācārya. This is one of the central doctrines of Śrī Vaiṣṇava tradition. The Upanishads through their teachings (Ācārya devo bhava - Taittirīya) emphasize the importance of an Ācārya. (1) Worship the Ācārya as the Lord Himself. (2) Swāmi Deśikan (Here on this earth, we do not consider any Gods equal or superior to my Ācārya). (One's Ācārya is verily God; He is the ultimate refuge. He is the supreme knowledge; He alone is to be extolled. He is the one to be coveted supremely; He is the supreme generosity). In view of the paramount importance of Ācārya bhakti, many Ancient Ācāryas like Nanjeeyar, Nampiḷḷai, Periya Vāccāṉ Piḷḷai, Aḻakiya Mañavāḻa Perumāḷ, Nāyanār, Swāmi Deśikan (now extinct Madhura Kavi hṛdayam), Tirukuṭantai Deśikan and others have blessed us with superb aphorisms for Madhura Kavi Āḻvār's divya prabandham. There are 11 verses in Kaṇṇiṇun Siṛuthāmbu prabandham of Madhura Kavi. The last verse is a Phala śruti describing the fruits of reciting this prabandham. In the rest of the ten verses, Madhura Kavi conceded that all the relationships that he should have with Bhagavān are instead with Swāmi Nammāḷvār. who was tied by Yaśodā with a small rope. nectar will spring from my tongue. I praise him with my tongue and relish it. I will approach the golden feet of Nambi of Tirukkurukūr. I wander and sing sweet songs about him. and see the dark, beautiful form of the divine god. that will be the finest thing I could ever receive. and he is my mother, my chief and the one who rules me. filled with pure golden palaces, and I dance there. for the next seven births. accepted me and made my bad karma go away. from Caṭakōpaṉ, the great Tamil poet. that he received from the god. His giving his blessing is the best thing in the world. that the best Brahmins know and recite. He made my heart learn the Vedas. My chief Caṭakōpaṉ has great fame. is the greatest blessing I can receive. even if he is not his friend. He will change him and accept him, and keep him with him. surrounded by beautiful groves where cuckoo birds sing. worshipping his feet decorated with anklets. is the friend of all who approach him. will see Vaikuṇṭha and abide there.